Two malls were planning to track shoppers' movements by following their cell phone signals, but they have since suspended the program, due to privacy concerns raised by a U.S. senator. NEW YORK (CNNMoney) -- Two malls are axing their plans to track shoppers' cell phones, after a U.S. senator raised privacy concerns over the weekend. As CNNMoney first reported last week, the Promenade Temecula in southern California and Short Pump Town Center in Richmond, Va., launched a survey on Black Friday, tracking shoppers' movements by monitoring the signals from their cell phones. The original plan was for those malls to continue the survey through New Year's Day, but after receiving a phone call from Sen. Charles Schumer's office over the weekend, they put the survey on hold. 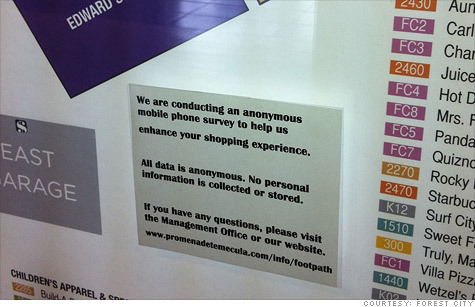 The technology used antennas set up around the shopping centers to anonymously track shoppers as they moved from store to store. Customers were notified of the survey via small signs, and the only way for them to opt out was to turn their phones off. In a press conference on Sunday, Sen. Charles Schumer said the malls should have given shoppers the choice to opt-in. "A shopper's personal cell phone should not be used by a third party as a tracking device by retailers who are seeking to determine holiday shopping patterns," the New York senator said in a statement. "Personal cell phones are just that -- personal. If retailers want to tap into your phone to see what your shopping patterns are, they can ask you for your permission to do so." While the Cleveland-based mall management company, Forest City Commercial Management confirmed that it tracked shopper data on Black Friday, it said it now plans to pursue an easier opt-out option for consumers. "We have temporarily suspended further trial of the technology while we work with the system developer on possible enhancements, and in deference to concerns raised by Senator Schumer," the company said. "We look forward to meeting with the senator and his staff, together with the system developer, to further explore his concerns." Schumer sent letters to Path Intelligence, the U.K-based manufacturer of the technology and Federal Trade Commission Chairman Jon Leibowitz. Schumer wants the the FTC to examine the legality of the technology, under U.S. privacy regulations. Sharon Biggar, CEO of Path Intelligence, told CNNMoney that she welcomes the chance to speak with the senator directly about privacy concerns. She points out that online retailers often track customers' movements in the digital world, without notifying shoppers or giving them an opt-in choice. "We are simply seeking to create a level playing field for offline retailers, and believe you can do so whilst simultaneously protecting the privacy of shoppers," she said. Both Path Intelligence and Forest City have reiterated that the technology does not identify shoppers' personal data like their name or phone number. Instead a random ID number is assigned to each phone, enabling the companies to track shoppers' movements anonymously, like dots moving around a screen. Schumer said he's concerned that hackers could get hold of the data, somehow linking the ID numbers to personal information. While Black Friday marked the first launch of this technology in the United States, it has already been used in Europe and Australia, with very little backlash, Biggar said. U.S. retailers including J.C. Penney (JCP, Fortune 500) and Home Depot (HD, Fortune 500) have also considered using the technology, she said. A Home Depot spokesman said the company had considered the technology but is not using it in any stores. A JC Penney spokesman declined to comment on its relationship with the vendor.